“I intend to fight it out along this line if it takes all summer,” Grant vowed. And he did: for the dark, close woods of the Wilderness to the Muleshoe of Spotsylvania, to the steep banks of the North Anna River, to the desperate charges of Cold Harbor. The 1864 Overland Campaign would be a nonstop grind of fighting, maneuvering, and marching, much of it in rain and mud, with casualty lists longer than anything yet seen in the war. 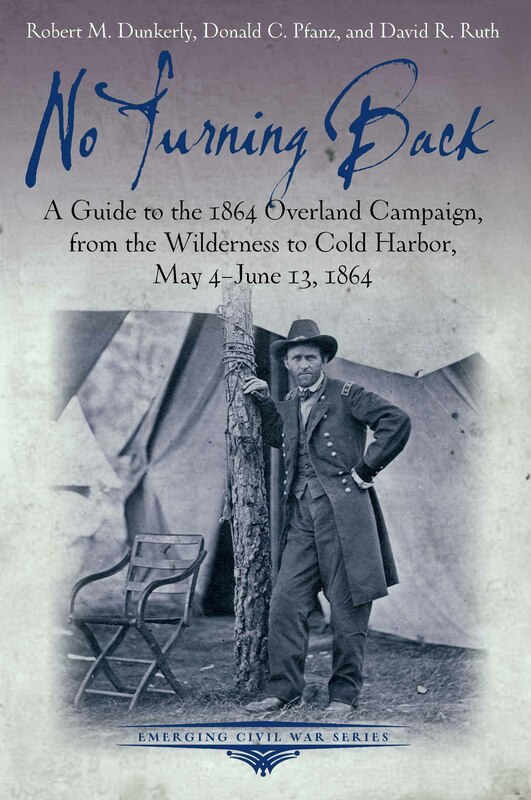 In No Turning Back: A Guide to the 1864 Overland Campaign, From the Wilderness to Cold Harbor, May 4-June 13, 1864, historians Robert M. Dunkerly, Donald C. Pfanz, and David R. Ruth allow readers to follow in the footsteps of the armies as they grapple across the Virginia Landscape. Pfanz spent his career as a National Park Service historian on the battlefields where the campaigns began; Dunkerly and Ruth work on the battlefields where it concluded. Few people know the ground, or the campaign, better.